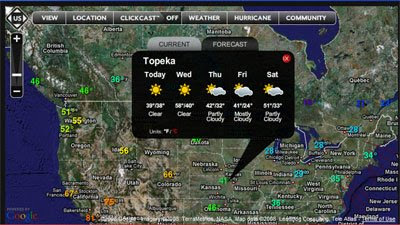 iMapWeather.com is an outstanding weather service that uses the Google Maps for Flash API. We have featured the site on Google Maps Mania before but iMapWeather.com have just added some amazing social networking features to their service. Users of iMapWeather.com are now able to post and share weather related photographs, videos, events, and Twitter-like messages, all localized inside the iMap®. Additionally, live streaming video will soon be available on the site delivered by storm chasers who are experts in getting in the right place at the right time to document tornadoes, severe storms, hurricanes, winter and ice storms from TornadoVideos.net. 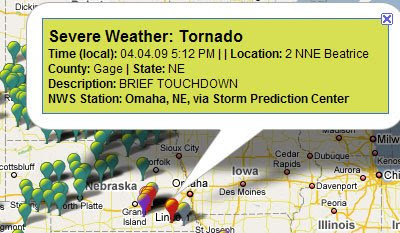 iMapWeather is also a Flash widget with an embed code that can easily be copied and pasted into any website. Individuals and organizations are already sharing iMapWeather maps on their websites, from Sport Fishermen.com to KETK, an NBC station in Tyler, Texas. This Google Map shows storm reports from across the US as reported by the National Weather Service's Storm Prediction Center. Each marker on the map represents a preliminary report of storm damage or storm conditions. If you roll your mouse over any of the map markers a very brief report of the storm conditions is shown. If you click on a marker full details of the storm are revealed in an information window. Different types of storm condition are shown on the map by different coloured markers. Great tool for seeing what's going on in the world of weather. Colored icons are especially helpful.